← Whole Foods contest finalist! When I have a hankering for muffins, I pull out a tiny cookbook, a brochure really. It’s called “New England Muffins,” and was written by Nancy Berzinec in 1987. 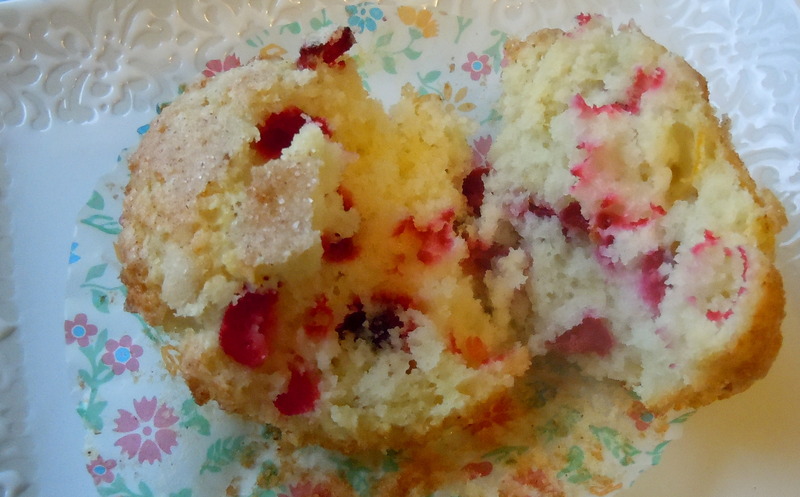 It has simple, unfussy muffin recipes that are completely reliable. These tender, light muffins go together in a flash. Orange zest adds a lovely, slightly bitter undertone to the sweet muffins. They are also just dandy with some walnuts or pecans stirred into the batter. I was out of oranges but had a big bag of gorgeous clementines, so I used their zest instead. Preheat the oven to 400 degrees F. Grease muffin cups, or line them with paper liners. Mix cranberries with zest and 1/2 cup of the sugar. Stir well, and set aside. Combine flour, 1/4 cup of the sugar, baking powder, and salt in a large bowl. Whisk together the egg, milk, and melted butter in a small bowl. Stir together the 3 tbs. sugar and cinnamon in a tiny bowl. Pour the egg mixture into the flour mixture and stir just until barely combined. Fold in cranberry mixture; the batter will be stiff. Fill muffin cups a bit more than 3/4 full. Sprinkle tops with the cinnamon-sugar mixture. Bake for 18-20 minutes. This entry was posted in baked goods, sweet stuff and tagged cranberry, muffins, orange, snacks. Bookmark the permalink. Bethany, what a terrific idea for extra cranberry relish. They sound delicious. 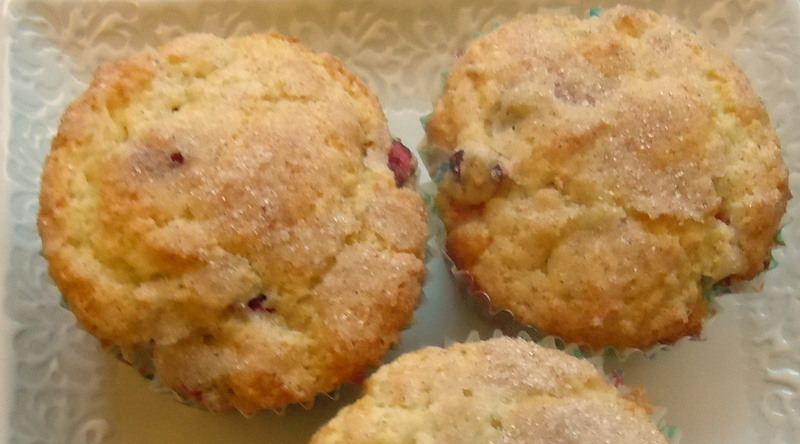 Jade, I hope you do try these muffins; let me know what you think if you do. And you’re right about the dark background. I still have a long way to go in the photography department, but as a former art director, I should have known better. I made almost exactly the same muffins last Saturday in order to use up leftover orange cranberry relish from Thanksgiving. The relish is just 1/2 an orange, skin and all, a cup of cranberries and sugar to taste, whirred up in a food processor until chunky. My muffin recipe is almost the same, but calls for the butter to be cut in, so I put dry ingredients with butter in the food processor, then add that mixture to the wet ingredients. The muffins are tender, sweet and have a nice tang. The smell draws everyone in to the kitchen.